As it turns out, people who are truly obsessed with cleaning treat it like a meditation, revealing that a strong mental game is equally as important as product knowledge. This got us thinking, so we sought the guidance of some well-known clean freaks (and we mean that as a compliment), like none other than our very own Senior Director, plus a few fan favorites. And what these experts in clean said might just surprise you. It's not that they love to clean (they don't), they're just better at it than the rest of us. Read on for wisdom from our favorite cleaning gurus who share how to take your clean routine to the next level. "Housekeeping, and the craft of cleaning, is a great way to express gratitude," says Melissa Maker, YouTube star and up-and-coming authority on home and living, via Apartment Therapy. Her approach to housework admittedly required an emotional shift, her previous relationship with cleaning was one of resentment; now, she assigns more weight to state of mind rather than a methodology. "This is the beginning of a very important feedback loop — loving our space because we care for it, and caring for our space because we love the feeling of living in it ... I can't say I love to clean, but I love what it does for me, and that's good enough." Start with her best 7 tips you really need to try today. Jolie Kerr is a cleaning expert whose Twitter bio ends with "Got messes?" so you know it's real. Author of the New York Times bestselling book, My Boyfriend Barfed In My Handbag ... And Other Things You Can't Ask Martha, and dedicated advice columnist, her flagship column, "Ask a Clean Person," debuted in 2011 and she's still slinging hilarious cleaning tips geared toward parents. Kerr treats every reader question as an exploration; one person wrote in with a problem that's mystified parents since at least the '90s: how to clean off the marks left on walls from her kid's Sticky Hand toy, "...I discovered that one of the primary ingredients in Sticky Hands is gelatin, and I know from my past work with dried Jell-O shots — this work contains multitudes — that [pineapple juice] dissolves gelatin. At this point, I figured it was worth a shot." Guess what? It worked. Our very own Senior Director here at Hunker, Leonora Epstein, is something of a cleaning savant in her own right. She found that scraping the sharp end of a bamboo skewer directly against dingy grout, and a little patience, is all it takes to achieve crisp tile countertops. "It's really not very complicated," says Epstein of her signature cleaning method, "If you have grout, especially on a kitchen counter, that has become super dirty, or has cracks that allow dirt to fall in, I just take a bamboo skewer to them to scrape the dirt off or to clean out dirt and food trappings that have gotten stuck." And we are forever grateful for her discovery. Ditch your soap altogether and save a lot of heartache, recommends dedicated green cleaning advocate and author of Creating a Healthy Household, Lynn Marie Bower. "The fats and oils in [bar] soaps create problems with soap scum," she said, via the Housekeeping Channel. Body wash is a detergent, she says, not a soap, so its formula will actually prevent build up in the shower, making your life easier. Bower developed a condition known as Multiple Chemical Sensitivity (MCS) over two decades ago due to indoor air pollution and now advocates for healthier cleaning, personal care, bedding, furniture, improving indoor air and water, and much more. 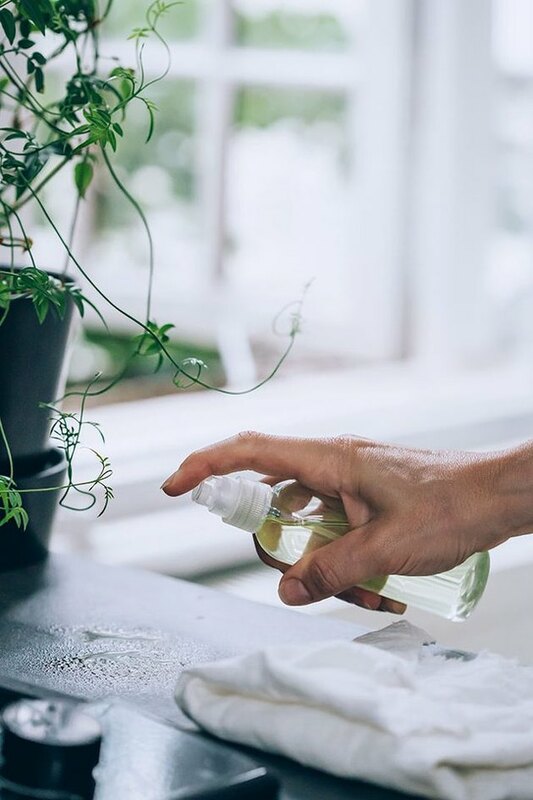 Healthier products are where better health and well-being begin, according to Bower, and it can be as simple and inexpensive as switching to baking soda or vinegar-based all-natural cleaning products. Who said there's no such thing as perfect? Definitely not Christine Satterfield, wife and mom who hates to clean, which ironically and out of necessity led to the creation of her blog: I Dream of Clean. The main goal when creating the perfect cleaning schedule was to help her (and now you) target and utilize those precious unused minutes in your day, so you can ultimately clean less and enjoy life, especially with younger kiddos, more. "Make a plan," says Satterfield, "It will help you stay focused and work quickly. You can download my free customizable template here." Free and it'll free up time? Now that's perfection. "Take a picture, set a timer for five minutes, and work on a small, visible area of your home," says self-proclaimed anti-perfectionist, blogger, and (much to her own surprise) Decluttering Expert, Dana K. White. She provides readers with hilariously honest feedback as they follow along her own never-ending "deslobification process" on A Slob Comes Clean. "When the timer goes off, take another picture. You'll be amazed at the visible difference five minutes can make, and you'll be encouraged to keep going in your decluttering efforts!" Here's another easily digestible 5-minute task for targeting clutter. For those who are more meticulously minded, follow the cleaning advice of part-time pediatric physiotherapist and full-time mom and homemaker, Jenn of Clean and Scentsible, who emphasizes the importance of completing household tasks. "Be realistic about the time that you have available and choose a space to clean that you can fully complete within that time frame. Gather all of your needed cleaning supplies before starting so you do not have to leave the room and risk the chance of distractions," then, she says, "When you are ready to start cleaning, work in a systematic pattern around the room — always cleaning from the top of the room to the bottom and from one side to the other to avoid having to clean the same area twice and cut down on cleaning time." Melissa Michaels of The Inspired Room specializes in design and organization. Twice voted the Reader's Favorite Decorating Blogger at Better Homes & Gardens magazine, she believes there is no good design without a well-kept home. How does she do it as a busy mom of four? "Since the beginning of our marriage, my husband and I have utilized what we call 'cleaning frenzies' to give our home a quick clean up every day. A cleaning frenzy might last ten minutes or even up to an hour. But everyone participates, including the kids." And it works surprisingly well: "Sometimes we focus on one room; sometimes it is an entire house frenzy. Sometimes it is a task frenzy, like dusting or cleaning all toilets! It works like a charm to make a big impact in a short period of time." Even one "10-minute cleaning frenzy" a day has the power to keep the frustration at bay, she says. Lauren McQuade is a writer, editor based in Los Angeles.